D-RTK is a high-precision navigation and positioning system that integrates advanced software algorithms with a GPS+BDS or GPS+ GLONASS dual-band, four-frequency receiver. The D-RTK system is compatible with a range of airframes, and gives the equipped system centimeter-level positioning accuracy both horizontally and vertically. 2.Can I use the D-RTK and the A3 Pro at the same time? Yes. But when mounted on a Matrice 600, positions for the two systems overlap. You will need to adjust the mounting position for one or both of the devices to uses them simultaneously. 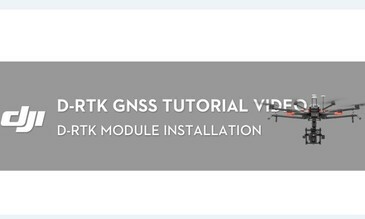 3.Do I need to use an A3 GPS module with D-RTK? Yes. When conditions are not ideal for the D-RTK, the A3 will shift to GPS mode to maintain flight safety. 4.Can I use the D-RTK Air System with a single antenna? Yes. To do so, the antenna must be mounted in the Master antenna position. When used with a single antenna, the D-RTK system will only be able to provide positioning information but no heading information. 5.How does the D-RTK calculate positioning and heading of an airframe? When the Air System and Ground System are within a 10km distance from each other, their absolute positioning accuracy will depend on the accuracy of the Ground Systems satellite-based positioning. The relative positioning accuracy between the Air System and Ground system is down to the centimeter-level. The D-RTK’s Difference Tec functionality triangulates the absolute and relative positions of each system to reach a final absolute accuracy of 2cm. For navigation, the D-RTK will calculate the position vector from the Master antenna to the Slave antenna to accurately determine its direction. 6.Can I use the processor in the D-RTK Ground System with the Air System and vice versa? Yes. The two processors are identical and interchangeable. 7.Are the Master and Slave antennas interchangeable? Yes. Remember to connect the antennas to DJI Assistant 2 and configure antenna offset parameters after switching places. 8.Is D-RTK more sensitive to environmental condition than GPS systems? Yes. Use D-RTK in open areas, unobstructed and free of interference. 9.Do I need to mount the D-RTK GNSS antennas in a specific direction? 10.Do I need to mount the D-RTK processor in a specific direction? 11.What should I do after mounting a new D-RTK system? Connect the D-RTK processors to DJI Assistant 2, install the latest firmware, and configure the antenna offset parameters for your system. 12.How do I configure the antenna offset parameters in DJI Assistant 2? Measure the distance between the gravitational center and the center of the antennas and enter that as the offset parameter. 13.What happens to the flying platform when D-RTK is subjected to strong interference and unable to position the system? The GPS module will take over positioning and navigation, and the system will continue to function as before. 14.Can a drone take off without the D-RTK having an adequately strong satellite signal? Yes, but in this scenario the system will fall back to GPS positioning only. If signal strength increases during flight, D-RTK will take over. 15.What happens if the D-RTK loses signal strength while flying? If the D-RTK is not able to receive the signal it needs for its full functionality, the system will fall back to GPS positioning and compass for heading. 16.When purchasing D-RTK, do I need to purchase DATALINK PRO separately? No. But you need to purchase the tripod mount for the Ground System separately. 17.How is the D-RTK powered? A single 3S-12S (12V-52V) battery, available with or without intelligent functions, provides power to the system. 18.Will D-RTK work when the aircraft is in ATTI mode? 19.If the Master and Slave antennas are not mounted in their default positions, will the aircraft’s positioning or heading accuracy be affected? No. However, you will need to reconfigure its antenna offset parameters to reflect the change in positions. 20.How is the D-RTK’s positioning affected if the Ground System is moved while the aircraft is in the air? The D-RTK has a mechanism to prevent accidents caused by repositioning Ground System. If the Ground System is moved within a short distance, the aircraft will follow. If it’s moved more than 50m away from its original position, the Ground System will update its location, while the aircraft hovers while waiting for its new position. 21.What is the D-RTK’s maximum transmission distance? 22.What will happen if DATALINK PRO loses signal during flight? For temporary loss of signal, D-RTK will enter Calculation Mode to triangulate its position and retain its accuracy. If signal is lost for more than 10 seconds, D-RTK will exit Calculation Mode and fall back to GPS positioning and switch to the previous flight mode.